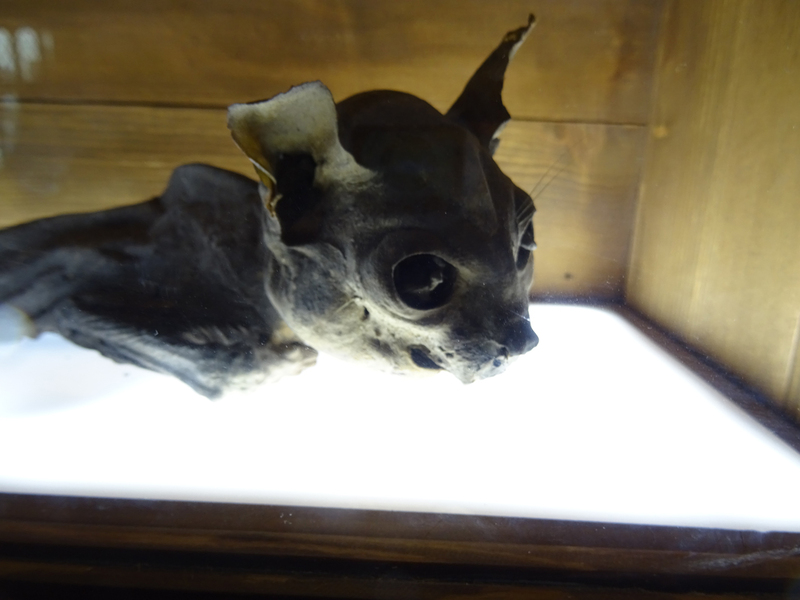 Moyse's Hall's newest mummified cat, recently acquired mummified cat, shortly before it went on display along with the others mentioned in this article. Photo: courtesy Alex McWhirter, Moyse's Hall Museum. It was once common practice for cats or kittens to be walled up (sometimes alive) during the building of houses, to bring good luck and to ward off fires and evil spirits. They are still being uncovered, usually from spaces in roofs or around chimneys. (King James VI of Scotland, in his 1597 philosophical dissertation on witchcraft Daemonologie, discusses how malevolent spirits or “spectres” that trouble houses are most likely to enter them via the chimney.) Those entombed cats that haven’t rotted away mostly date from the 17th and 18th centuries and have been naturally mummified and preserved, giving them a scary, skeletal look, like hairless gremlins. One such specimen turned up at The Trading Post curiosity shop in Wells, Somerset in 2012, (Daily Mail, 9 May 2012,) brought in by a customer who found it during restoration of their 300-year-old house. 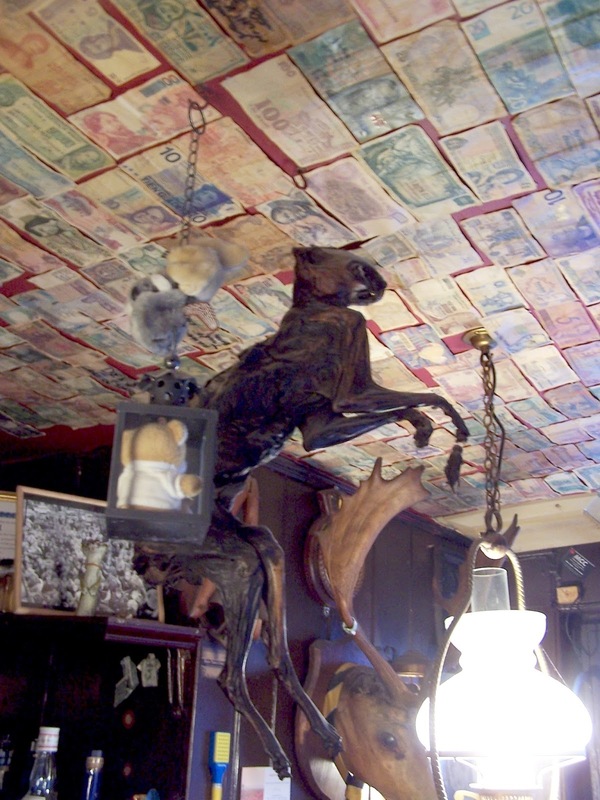 There’s a mummified cat on show at The Stag Inn pub in Hastings, while the one you can see at Christ Church Cathedral, Dublin, was found wedged up an organ pipe. Although mummified cats on display in the British Isles are a bit unevenly distributed, fans of the slightly gruesome with moderately strong stomachs can take in an easily do-able cluster of them in the western half of the county of Suffolk. They’re even handily all on the same bus route. If you’re doing the West Suffolk mummified cat safari by car, it’s all within easy reach of the A134. The best place to start your West Suffolk mystery cat cluster tour is at its epicentre in Bury St Edmunds. (Just “Bury” to locals, always pronounced “berry”.) 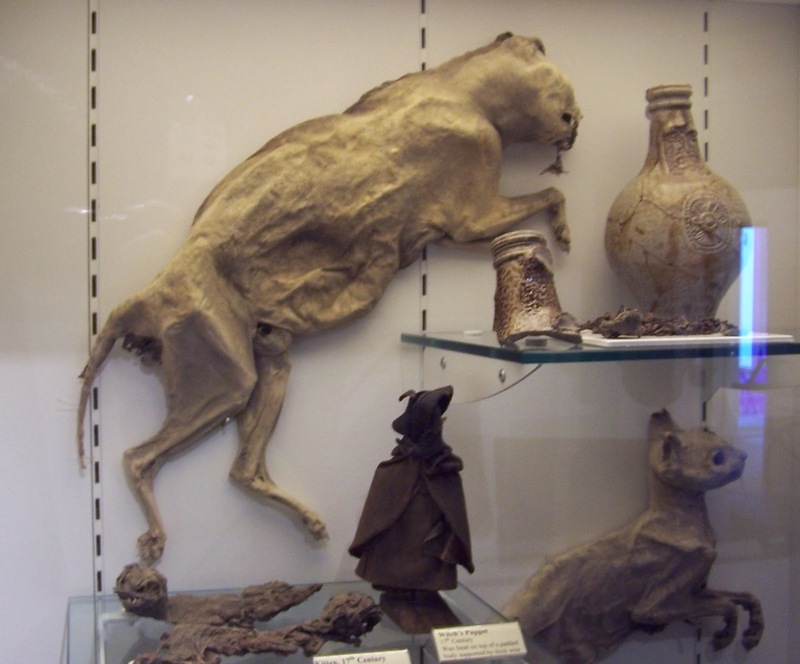 There are two mummified cats and two mummified kittens on display in Bury’s 12th century Moyse’s Hall, now a museum. It also has some examples of an Elizabethan regional speciality in its public collection – witch bottles. These are earthenware bottles filled with pins, needles and nails and concealed as a protection against witches. Moyse’s Hall’s mummified kittens are part of the Barley House Hoard, from a farm in the mid-Suffolk village of Winston. This hoard of objects deliberately dropped into a space near the chimney date from around 1650 to 1730 and includes six felines in total, with a rat (sadly currently not on display at Moyse’s Hall), many shoes, pigs’ trotters, goose wing bones with notches cut in them and plenty else besides that presumably brought good luck. The scored goose bones could have been some form of crude almanac recording saint’s days. The Barley House Hoard is one of four “spiritual middens” in the county of Suffolk, accumulations of stuff found in houses dropped into spaces around the chimney for good luck, sometimes spaces specially built into a dwelling. Other such Suffolk lucky hoard of stuff deposited in spaces near chimneys include Cutchey’s Farm – a broken firkin lid, horseshoes, padlocks, stirrups, a shoe with a hole in it, through which a rat skull was found protruding, along with loads of other stuff. Archaeologist Timothy N D Easton described (in Historical Archaeology, 2013, 47, 1) how Cutchey’s Farm’s then owner, facing a run of financial bad luck after parting with the hoard in the 1980s, begged for the return of the “lucky” items. They eventually settled on the re-internment of a single child’s shoe. Suffolk hoards of lucky charms have also been pulled out of houses at Hestley Hall – broken pots, chicken’s feet, fruit stones and a lot else besides – and Earl Soham – over 30 shoes from the 1830s, gloves, a bottle containing a horse medicine made from hornbill glands from India, a pair of braces, a framed mirror, a bunch of lavender. Earl Soham’s 19th century hoard was less about good luck – it had turned into a sort of early time capsule. Another six mummified cats were discovered by builders doing work on a house in Fakenham Magna, not far from Bury, in 1972. (They’re not on display anywhere as far as I know.) The builders reported being scared by strange tapping noises and footsteps while working on the property. Also in Bury, a few minutes walk from Moyse’s Hall, is The Nutshell pub – allegedly Britain’s smallest public house – which has a fine, leathery specimen of a mummified cat hanging from the ceiling, along with all the foreign banknotes that have ended up there over the years. Should you find yourself in the pedestrianized centre of Bury, The Nutshell is well worth a visit. In its bar that’s just 15 feet by 7 feet, it’s almost impossible not to get pulled into one of the conversations that’s going on there, often among Bury’s tiny “alternative” community. If you can’t fight banter with even better banter, it’s not for you. 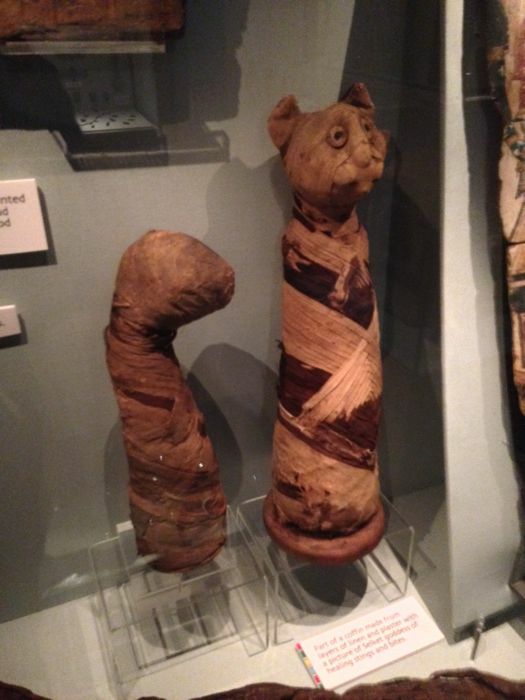 Ask nicely for permission to photograph their magnificent mummified cat, and whatever you do, do NOT touch it. Like a lot of East Anglian mummified cats, there’s said to be a curse attached to it. I heard an apocryphal tale about The Nutshell’s mummified cat being stolen, as a result of a prank by “other ranks” in a locally-based military unit, only for it to be returned not long after by a grim-faced off duty soldier (out of uniform but still identifiable by his haircut) who turned up at the pub at opening time and handed it back without a word. From Bury bus station, the Chambers 753 bus takes you on an uneventful 35-minute drive to Lavenham. Most of the rural rides round here are on double deckers, so enjoy the view. You know you’ve arrived in the village of Lavenham, with its 321 listed buildings, when the houses all go a bit mental – suddenly every building is a half-timbered eccentric wonky-angled extravagance with insane overhangs, often painted in bizarre colours. Look down any side street and every building in it has just the same level of medieval madness. It used to be one of the Wool Towns, where immensely wealthy wool magnates settled. While it’s a town no more, most of its 15th and 16th century Wool Town era houses still stand. Head straight for Lavenham’s white painted Guildhall with its elaborately carved timbers. It once housed a jail, but now it’s a National Trust property and local museum whose magnificent mummified cat is worth the price of admission alone. He goes by the name of Rameses. He was found hidden in a roof in one of the nearby houses. So magnificently well preserved is he that he still has the tips of his ears and most of his whiskers. None of the staff could tell me why he’s called Rameses, although I suspect it’s something to do with Egyptians and mummification – Egyptologist Robert Gayer Anderson and his twin brother Thomas settled in Lavenham in the 1920s and raised money to save the Guildhall. If you have time to kill in Lavenham before the 753 bus (from The Swan pub) takes you onward to your next mummified cat stop in Sudbury, there’s the De Vere House. This 14th century red brick and half-timbered residence was world famous even before it featured as Harry Potter’s decaying birthplace and ancestral home in the film of Harry Potter and the Deathly Hallows, Part 1. Check out also the Market Square, which stood in for the market square of Bury St Edmunds in the not particularly historically accurate witch-burning scene in Hammer House of Horror’s Witchfinder General, starring Vincent Price. Next stop Sudbury, birthplace of the painter Thomas Gainsborough (his most famous painting, Mr and Mrs Andrews, was painted in a landscape on the edge of Sudbury.) Gainsborough’s statue stands in the town’s market place, not far from Gainsborough’s House, now a museum, at 46 Gainsborough Street. The fortean traveller to Sudbury, however, would be more interested in a very steep hill down by the River Stour. Here there are highland cattle grazing in nearby fields by the riverbank and swans gliding down the river. Here is Walnut Tree Lane, one of the very few slopes in Suffolk so steep that if you’ve come here by bike you absolutely have to get off and walk, as I did. At the end of this lane is the Mill Hotel. 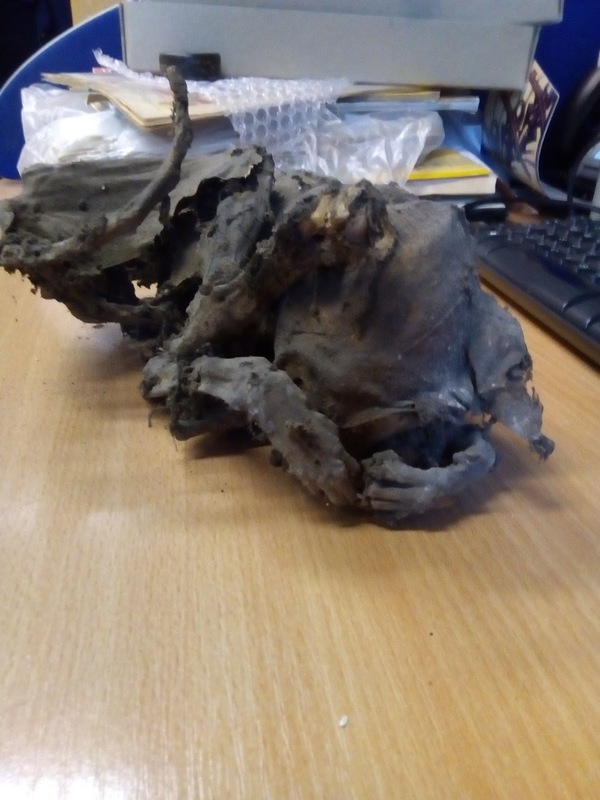 Even though there was a wedding reception about to start when I dropped in, the very welcoming receptionist had absolutely no problem with my request to crouch down by the floor in the corner and photograph their mummified cat. It’s on display in a glass-topped casket set in the floor. Its skin is a ghostly white; it’s curled up with its head looking over its shoulder, a fang revealed. It’s a fine specimen in a good state of preservation, apart from a few large holes chewed in it by some kind of insect. It was found in 1975 and reburied in its casket by the then Mayor of Sudbury, after Canon Peter Schneider of the Church of England reportedly declined to perform a religious ceremony for a dead cat. Now it’s on display under thick glass in a recess in the corner of the floor in the lobby, where it was found. As far as I’m aware, for the next nearest mummified cat on display you’d have to go all the way to King’s Lynn, over 40 miles north of Bury in North Norfolk, where there’s one at The Red Cat pub and hotel. 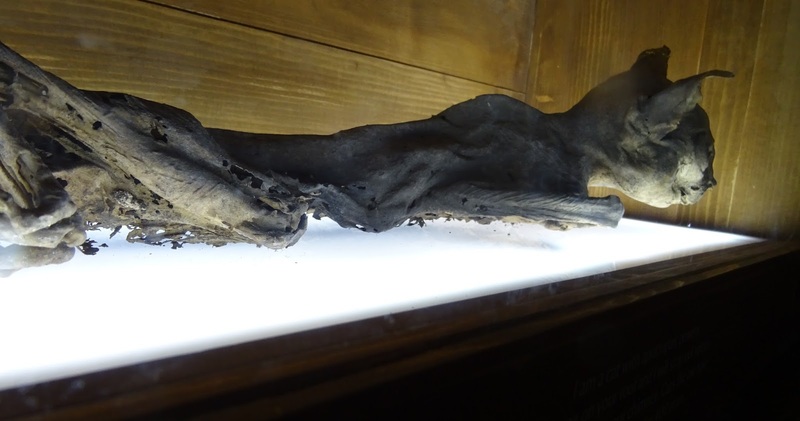 However, dedicated mummified cat spotters can take the Beestons 91 bus from Sudbury bus station all the way to Ipswich, which has good train connections and whose Ipswich Museum has a modestly-sized Egyptology gallery complete with two mummified and embalmed Egyptian cat mummies. The bus journey from Sudbury to Ipswich on the Beeston 91 double decker bus – run by England’s oldest private sector bus company – takes just over an hour and it’s quite a ride. There aren’t may stops on the A1071 road that takes you through South Suffolk, so the driver has his foot down on the gas pedal most of the way. This article is an update (on 2 March 2018) of the article that appeared in Fortean Times, with an additional photo of the newly acquired mummiified cat at Moyse's Hall and additional information on the Gayer Anderson twins. Lavenham Guildhall, for opening times www.nationaltrust.org.uk/lavenham-guildhall, adults £6.50. Chambers 753 bus service – Bury St Edmunds to Lavenham (35 minutes), Lavenham to Sudbury (30 minutes). Buy on the bus day tickets for unlimited travel on their network at £9 for adults. .
Beestons 91 or 91C bus service from Sudbury bus station to Ipswich (buy tickets on the bus.) . Neither bus service runs on Sundays.